Your ultimate guide to St Patrick's day celebrations from Belfast to Dublin and Newry to New York. 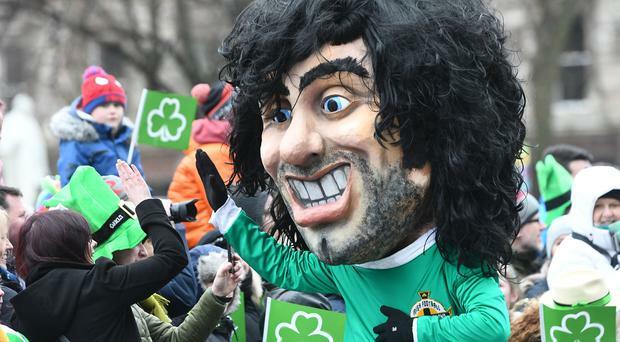 Thousands of people took part in festivities across Northern Ireland to celebrate St Patrick. In Belfast events included a carnival parade and a free concert at Custom House Square. Headlining this year's concert was former JLS star Aston Merrygold. Other parades took place in Londonderry, Newry, Armagh, Strabane and Downpatrick. In Dublin Irish actor Liam Cunningham, famous for his role as Davos Seaworth in television series Game Of Thrones, led the 2,000-strong parade. Star Wars actor Mark Hamill was its first international guest of honour. In New York Taoiseach Leo Varadkar walked alongside his partner in the city's St Patrick’s Day parade which up until recently had banned LGBT groups from marching. Earlier Sinn Fein's former president Gerry Adams was honoured at a St Patrick's Day breakfast event hosted by the mayor of New York on Saturday. Elsewhere around 300 iconic landmarks and sites in 50 different countries took part in this year's so-called Global greening.